Published in the South Kent Gazette, 18 February, 1981. The altar, a choice work of art, was the gift of Mr Brooks, the architect. The framework is of oak richly covered with gold, and on the top was placed a handsome slab of polished marble weighing 15cwt. At the consecration, however, the Bishop of Dover, Dr Eden, objected to the marble slab, and before the ceremony could take place, the builders’ men had to lift the slab off the frame, which was not an easy task, and its place was taken, the Dover Express reported, on April 21, 1893, by some rough boards cut to fit to form a temporary table top. This treatment of the gift so hurt the feelings of the architect that he left the place, and took no further part in any of the proceedings, although he came in for considerable praise at the luncheon which followed the consecration service. Another feature much admired at the opening of the church was the font, a bowl of red granite supported by a centre stem and surrounded by shafts. In the tower was placed one 8cwt bell, cast in Birmingham. After the consecration a new porch was added, a rectory built, and the foundations of a western tower were brought up to ground level with the materials of the old church. The old parochial schools, built about the year 1840, stood on part of the site of the new church. The consecration was performed by the Bishop and the ceremony was attended by nearly 30 members of the clergy from all over the diocese. During the service Dr Eden appealed for gifts of furniture and other items to complete the furnishing of the church. At the luncheon that followed in the Granville Street schools it was stressed that another £4,000 needed to be raised to pay for the construction of the church. A collection on the opening day raised £109. A list of the rectors of Charlton has been compiled, which, with the exception of one or two dates, appears to be perfect. From 1291, when Simon of St Albans was rector, until 1889, when the Rev S. F. Green was inducted, there were 39 names. The first rector of whom we have any information is John Goldsmith, who was rector in 1447. At the same time he was also rector of St John the Baptist, which was a parish church under the roof of St Martin-le-Grand. It is mentioned in a deed long preserved by the old Dover Corporation, that Thomas Coombe, brother of the Prior of St Martin’s of that period, conveyed to this John Goldsmith and Thomas Tokey all his property in Dover and the county of Kent. John Clark, who was the rector of Charlton from 1514 to 1541, was the Master of the Maison Dieu, and it was he who supplicated Henry VII, and obtained from him a grant, by which the first harbour works were carried out at Archcliffe Point. John Burnell, who was rector from 1541 to 1582, was one of the brethren of the Maison Dieu, who, on the closing of that House, received a pension for life of £6 15s. 4d. a year. It was seven years after the closing of the Maison Dieu that he obtained the rectory of Charlton. William Watts, who was rector of Charlton from 1587 to 1603, was also rector of St James’ from 1579 until 1606, when he resigned. William Brewer, who was rector of Charlton from 1690 to 1700, was previously rector of St James’s and vicar of Hougham. David Campredon, who was rector of Charlton from 1700 until 1730, was at the same time minister of the French Huguenot church in Dover. He became minister of the French church in Dover in 1692, and in January, 1700, he was made rector of Charlton, retaining the pastorate of the Dover French church until 1709, when he resigned it, being at that date presented to the joint livings of Shepherdswell and Coldred, which he, together with Charlton, held till his death in 1730. Richard Monins, who was rector of Charlton from 1758 till 1770, was a member of the Monins family, who were the patrons of the living, many of them being buried in the church. He died at Canterbury, and left a fortune of £30,000 to his brother, a lieutenant in the army, and to his sister, who was unmarried. John Monins, who was rector from 1811 until 1829, was of the same family. It was he who rebuilt the church. Frederick Augustus Glover, who was rector from 1837 until 1845, like his predecessor, John Clark, took great interest in Dover harbour, on the improvement of which he wrote several tracts and pamphlets. He also wrote on political and theological disputes. During his time the first parochial school was built on the margin of the churchyard. It was under his direction that the circuit of the town wall was traced and recorded in 1845. In the year 1840 he registered at the Patent Office the specification of “an improved instrument for the measuring of angles.“ In a good many ways Frederick Augustus Glover proved himself to be a learned and ingenious man, but failing to discover the secret of acquiring as much money as he found it necessary to spend, he became a bankrupt, and afterwards obtained an appointment in one of our colonies. The Rev Charles Martyn, who was rector from 1845 till 1849, in the year 1847 somewhat enlarged the church and beautified the interior, £200 being at that time obtained for its restoration from the Incorporated Church Building Society, and as a condition of that gift, 258 of the sittings—nearly all of them—were made free. There is nothing left on record of John Fernie, or of his successor John Bridger, who only held the living three years between them. John Francis Baynham, who was rector 36 years, has left behind him the record of a saintly and kindly life, and before his death he, at his own expense, had the satisfaction of placing the patronage of the church in which his best years were spent, in the hands of the authorities of Keble College, Oxford, thereby making sure of a successor after his awn heart, and also securing the augmentation of the living. Sydney Faarthome Green, inducted in 1889, we have already mentioned. For the principles of the Church of England, as he saw them, he in a previous parish, sacrificed both position and personal liberty. For these sacrifices he looked for no earthly reward and he received none except that his stand won the admiration of a large section of the Church of England, and the beautiful church in which he ministered, is really a memorial to his steadfastness. Charlton Green recalls Charlton Fair, which was held annually for centuries on July 6th, which, according to the old style, was the patron saint’s day. This fair being for one day only was no doubt in the beginning a strictly business institution, intended to bring dues to the parish and to give the villagers an opportunity of purchasing goods which at other periods of the year were not obtainable. (Details of 1833 newspaper advertisements relating to the fair were given in part 100 of this reprint of John Bavington Jones’ book). 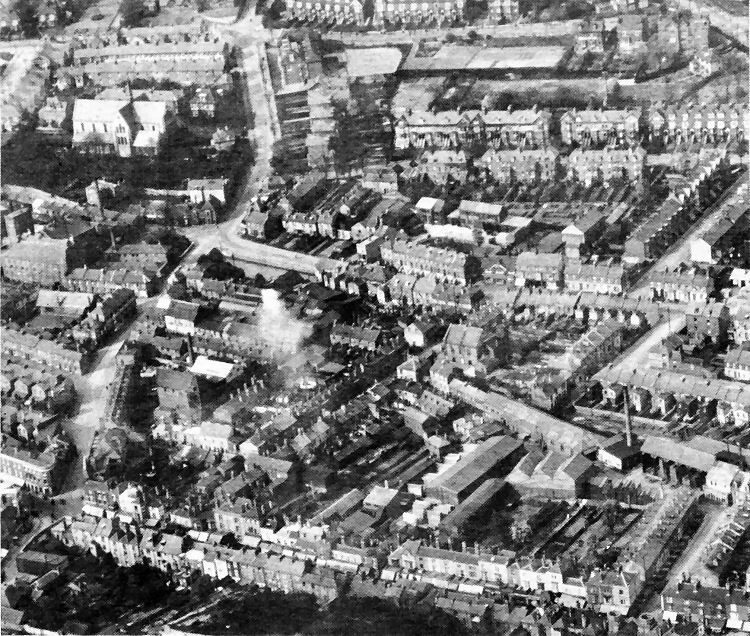 This aerial view of the Charlton Green High Street area dates from the early 1930s and features many buildings which have disappeared in the past 50 years. Charlton Church is. in the top left corner with Charlton Mill below and the Falcon Hotel, on the corner of Bridge Street and London Road, near the bottom left hand comer. Bottom right is Wood Street leading to William Crandall’s timber yard which is now the site of the Sainsbury car park. In the centre of the picture is Charlton Green, with Salisbury Road to the rear and Castle Avenue and the Girls’ Grammar School near the top of the picture.